Radioactive decay results in the emission of either: an alpha particle (α), a beta particle (β), or a gamma ray(γ). An alpha particle is identical to that of a helium nucleus. It contains two protons and two neutrons. 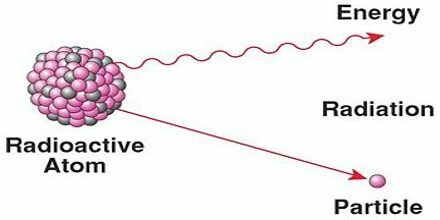 A beta particle is a fast moving electron which is emitted from the nucleus of an atom undergoing radioactive decay. Beta decay occurs when a neutron changes into a proton and an electron. Gamma rays are not charged particles like a and b particles. Radioactive decay is the spontaneous breakdown of an atomic nucleus resulting in the release of energy and matter from the nucleus.